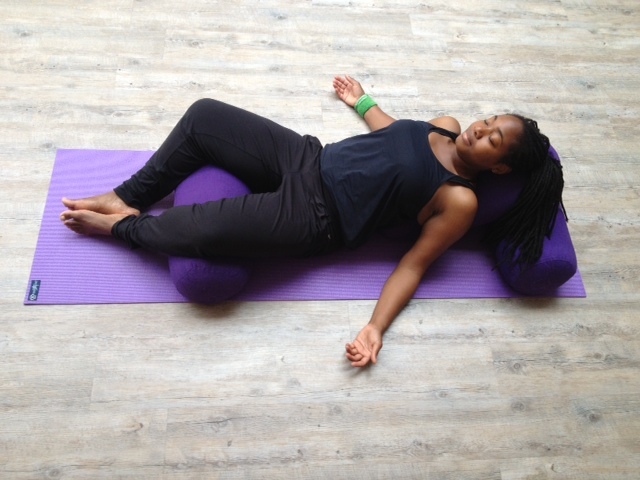 It’s the second day of Sally Parkes’ blissful weekend yoga retreat at Tilton House. I practice Astanga with Sally and I credit her with helping me get past my fear of this style of yoga. It’s also with Sally’s guidance that I got into my first ever headstand in my life. Ever. So, when Sally mentioned her retreat and I realised I was actually free that weekend I leapt at the chance to go. To be honest though, as soon as she mentioned we’d be doing yoga in a yurt I was there! Sally collects a few of us from the station and I meet the first of the lovely fellow yogis I’ll be hanging out with over the weekend. 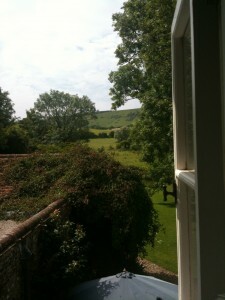 On the drive through Lewes I already feel myself starting to de-compress from a stressful few weeks. On our arrival at the instantly impressive Georgian house we are warmly welcomed by Polly and Shaun who run the place and Willy who is also a very knowledgeable gardener. We meet a few other residents too – cats Miko, Maui and Hector, and gentle Weimaraner, Barclay. Shaun gives me a quick tour of the house which was once home to economist Maynard Keynes – a key figure in The Bloomsbury Group – and his ballerina wife Lydia Lopokova. From the bright open kitchen, to the library, courtyard, conservatory and gardens (complete with hammocks on the lawn) there are ample inviting spots for quiet reflection or to curl up with a book. In fact, I note there are many books all over the house available for guests to read. Shaun shows me the room I’ll be staying in – the welcoming Mezzanine with one bed located up a ladder (bagsied by my room-mate). In fact, the beds look very comfy indeed and I note that there’s a good selection of books here to flick through as well. There’s also a stunning view of the South Downs from the window and I spy a couple of horses in a field just beyond the house. After getting settled a few of us wander across the lawn, past the hammocks, fire pit and up a little path through the trees to discover… The Yurt! It’s actually, bigger than I’d imagined and from the inside it looks a bit futuristic with the pattern made by the wooden supports across the ceiling. I can’t wait to practise in there. As everyone gradually arrives it soon becomes clear that the group gathered for the weekend is a lovely bunch of people. 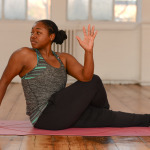 There are varying degrees of yoga experience among us, from regular practitioners to the quite new to those who do the occasional class, DVD or self-practice when they can. Our welcome yoga class in the yurt with Sally is beautifully calming, allowing us to recover from the Friday afternoon traffic and trains we’d endured to get there. By the end of the class there is the feeling that we are most definitely officially on retreat! Our first class is followed by our first meal. We gather around the table in the garden for a delicious bean chilli with cashew cream. The food for the whole weekend was a revelation! So hard to do justice with words. Everything was vegetarian or vegan and expertly prepared by resident chef, John who catered to the various food requirements among the group. Speech is replaced by lots of satisfied noises around the table with one lady determined to get that cashew cream recipe by the end of the weekend. As darkness begins to fall we make our way back to the yurt, now comfortably full from dinner for some Yoga Nidra. The yurt is transformed with candles and blankets. Sally talks us through an incredibly relaxing sequence. (I think I might have actually fallen asleep part of the way through…) We wander back to the house snugly wrapped up and pleasantly sleepy. Time for bed. I wake up early on Saturday morning having had my best night’s sleep in weeks. (That Yoga Nidra is magic!). So, 7.45am Dynamic Yoga doesn’t feel like a rude awakening. And I always love practising to a bit of music in the morning. Sally takes us through an invigorating sequence. There is lots of laughter among the group (Sally’s giggle is quite infectious) and I really like that Sally doesn’t teach in a forceful style, as can sometimes be the case with dynamic practices like Astanga. It means that the postures feel more accessible for everyone and Sally offers modifications along the way for whoever wants to use them. After a hearty, healthy breakfast including a tasty green smoothie made by Sally, some free time beckons, so a few of us go for a walk. With the help of some directions from Shaun we head up the flint path round the corner then climb upwards to find the sea. Along the way we pass horses, sheep, cows and I think I even spot a couple of grouse (I’m a city girl – I get very excited about these things and being surrounded by green!) It is such a gorgeously bright, sunny Saturday morning – one of those days where it feels like the colour dial on the world has been turned up to ‘full’. We work up such a sweat getting up to the top of the hill that we almost expect a round of applause from the sheep in the field for making it. But it is worth it – the expansive views of the lush Sussex landscape are incredible – a perfect backdrop for the paragliders we see, and in the distance there is a clear view of the beach at Seaford and the English Channel. We make the downhill walk back to the house in time for Pilates. My last Pilates class was a good few years ago. It’s not quite the same as yoga and I find I have to be really conscious of my movements. The class is challenging yet enjoyable and it reminds me of why I used to like Pilates so much. It makes me think about getting back into it. After a bit of chill-time reading outside I peel a reluctant Miko from my lap for my afternoon treatments with the lovely Natalie. We go for a bit of a walk around the gardens to discuss the treatments and I also learn that Natalie will be guiding us through meditation that evening. I go for reflexology, an aromatherapy massage and a holistic facial. All complete bliss. I float into 6pm yoga – our third class of the day – a few minutes late. Some of the guys are surprised I showed up at all after my marathon treatment session. Little do they know I rarely miss any yoga opportunity! Our Saturday night dinner of beet burgers with that rhubarb and ginger crumble is yet another winner. That confirms it – I really need to be more inventive with my cooking at home. A little later we have our meditation class with Natalie. She teaches us about the Metta Bhavana – the Buddhist loving kindness meditation – and guides us through practice. I’m really grateful to Natalie for this – I’ve struggled with meditation so far but I feel the Metta Bhavana is something I can take with me and build into my day. The walk across the dew covered grass to Dynamic Sunday morning yoga reveals that some of us are feeling a little less energetic than the day before. I think it’s a combination of that ‘wanting to stay in bed on Sunday morning’ feeling and not really wanting to go home later. There are still a lot of laughs in class though and we even manage a bit of headstand practice. By the end of the class we’re all much more bright-eyed. And ready for breakfast (of course). That morning there’s time for a bit of chilling out with the Sunday papers and enjoying some more sunshine before Pilates. The weather for the entire weekend could not have been more perfect. When we get to the yurt and see the balls we’ll be using as props it is funny how everyone instantly reverts to a child-like state and starts playing. We’re definitely more alert than we had been at 7.45am. Then Sally puts some Bob Marley on for us practice to and we perk up even more. “If I’d known all it would have taken was balls and Bob Marley, I would have done this before,” Sally jokes. Still warm from the oven corn-bread accompanies our soup for lunch. Some of us are a bit wistful that the yummy fruit tart with cashew custard will be our last dessert of the weekend. Any chance we might be able to recreate some of what we’ve had at home? A few of us managed to corner John the chef about some of his ingredients. And my fellow yogi succeeded in getting that cashew cream recipe. The last couple of hours whizz by all too quickly, but there’s time for a quick wander up the path to Charleston Farmhouse – home of The Bloomsbury Group – to look round its quintessential country garden before we have to go. There are farewells and some exchanging of contact details before Polly kindly gives us a lift to the train station. On the train back home I am feeling fully restored. I’d been looking forward to this weekend so much because it would be a long overdue break. I had an inkling it would be good but the retreat way surpassed expectations. A few of us talked about coming back for future weekends, so hopefully there will be more trips to Sally’s retreats to come.